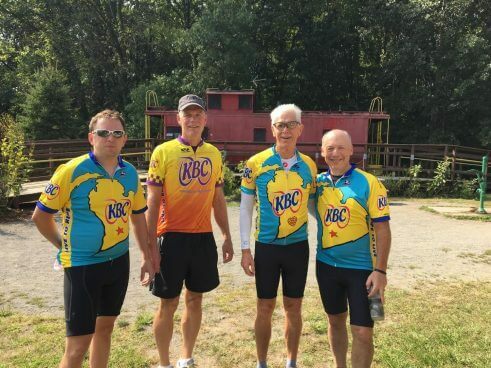 It’s hard to believe that the KBC Anniversary Ride is less than a month away! Where in blazes did summer go? 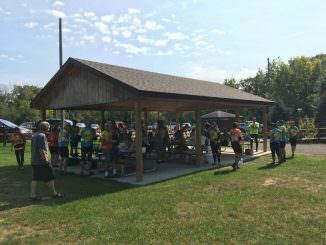 So, circle your calendar for the third Saturday in September (September 16, 2017) and plan on having a fun day on your bicycle and having lunch with other members of the Kalamazoo Bicycle Club. As in the past, we will start and finish our ride at the Kal-Haven Trailhead on North 10th Street. After riding join the party and enjoy a well-earned meal with your favorite bike-buddies at the pavilion there. Plan on rolling out at 10:00. We will have routes and paces to accommodate various abilities. Ride maps will be available at the start. You will want to pick a route and a pace that will have you back at the Trailhead by noon because that’s when the potluck will begin, right at 12:00. We will provide pizza, drinks, plates, cups, napkins and flatware. Please bring a side dish or dessert to pass to replace all those calories you burned on the ride! Invite a friend to join us as well. We look forward to seeing you at the Kal-Haven Trailhead on Saturday, September 16! Here are a few photos from the 2016 Anniversary Ride.